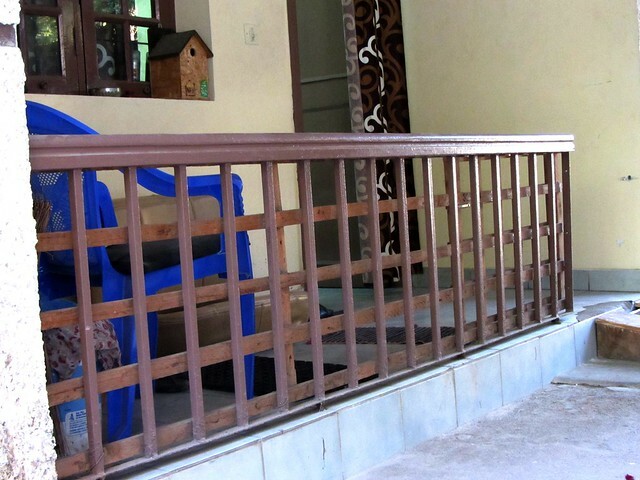 The house we live has a sit out/portico and what makes it pretty was the railing in wood and iron. The tenant who stayed here before us has added plank frame/fence to the already existed rail. 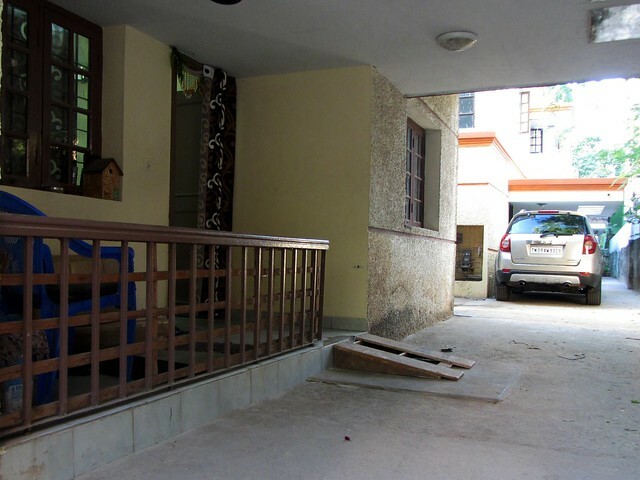 It also has a wood gate which truly helps us preventing our pet getting out of home and she also enjoys being untied to roam freely inside the home. During my visit to Palavakkam beach on Sunday, I find two fishermen putting their manpower in oar against the offshore tides in their catamaran rather using a motor. But only later I realized it is because of 45 day annual ban on deep sea fishing, to facilitate breeding of fish. According to the Tamil Nadu Marine Fisheries Regulation Act 1983, the ban was enforced for the conservation of species propagation during the breeding season, which comes into force from April 15th, halts the fishing operations by mechanised and motorised boats. 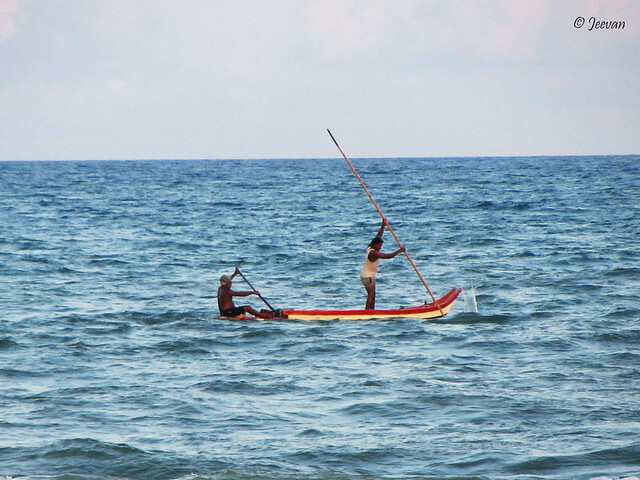 The fishermen were on their chance looking for fish and the flag coloured boat was rowed by both the men but in two different ways. One was putting oar sitting well on the rear and the other stood centre and propel the boat with a pole, which seems to be called punting. 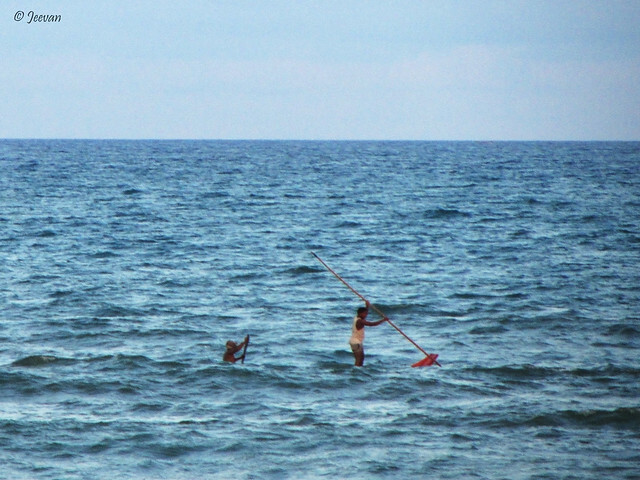 I really wonder how long could they go by like this against the heavy ocean wind. 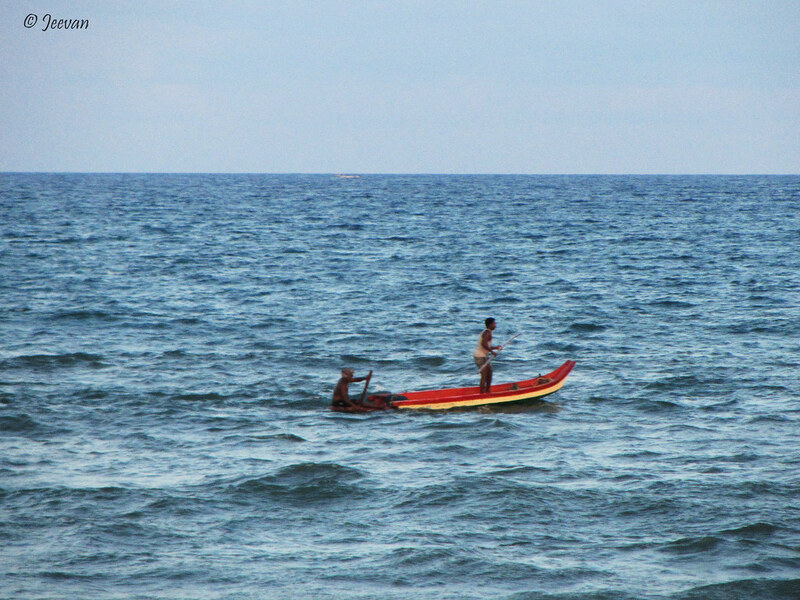 I know this is how fishing has been before motors are found and fixed to catamaran, and there are fishermen who don’t know anything rather fishing seem to be hooked this way instead sit back and wait for the ban period. 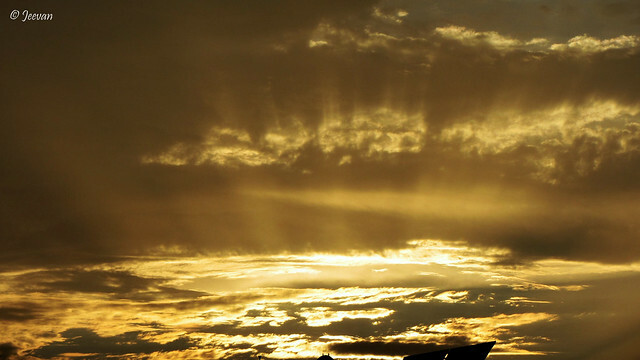 While the scene here was like this, the other side, were the sunset, was quite drastic and splendid. 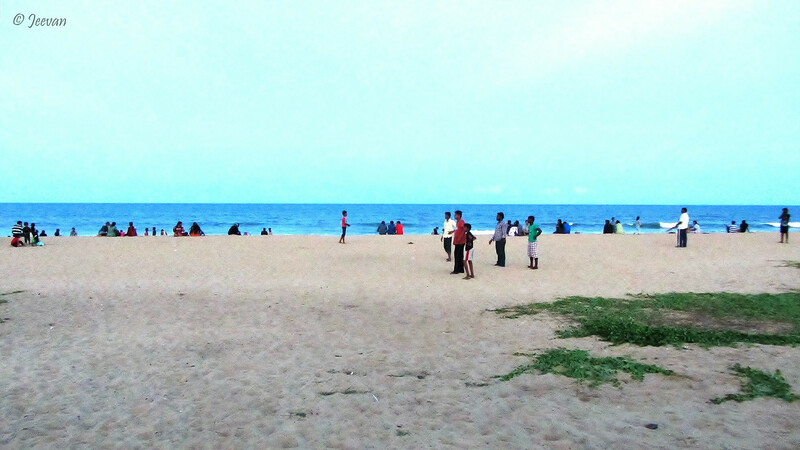 Even though the beach was crowded enough for being Sunday and summer evening, it was quite wonderful being out and to Palavakkam beach after long time. During my reside in our flat in Thiruvanmiyur I used to visit this beach at least twice a month and it is the most quiet being among the beaches in Chennai. Last year during my vacation to Ooty, I come across this two horses walk past the cottage we stayed over there. 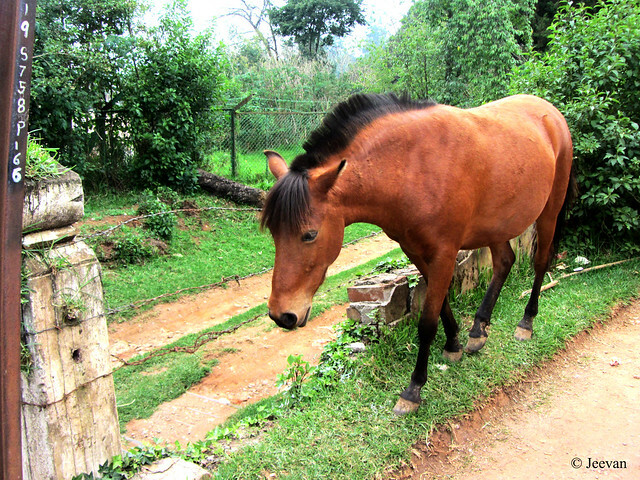 The horses moved along a barbed fence very carefully one behind another, helped capturing them at individual. The driveway on the other side leads down to a bungalow and the horses where come from a residential area, far behind where we stayed. Later I noticed there’s also a fence on the other side of the driveway. I have been on ECR (east coast road) many time, but haven’t led beyond Mamallapuram that much on the scenic road and during my occasional drives across Kalpakkam, I used to come across a Lil beautiful temple/shrine on the left side of the road and within a compound wall and gate, that led inside, the temple look pretty in white. During a course to Alambarai Fort few years back, I stopped and clicked pictures on the temple (from the road) but I haven’t noticed the name of the temple, the idol it hold, even more than 2-3 time I have passed the temple after that, I had no idea of looking beside. 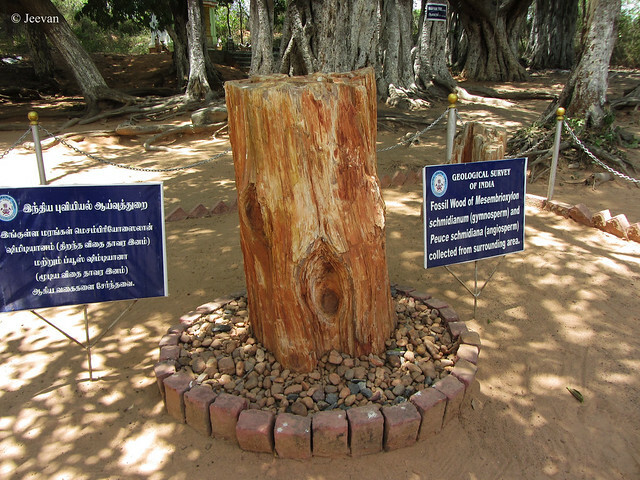 But during my recent drive to Pondicherry, I come to know the name of the temple – Sri Vidhya Ganapati Temple, from a board at the entrance. So it is a temple dedicated to Ganesha, also known as Ganapati and Vinayaka. At home when I Google with the name of the temple and locating it on the maps, I get to know the temple belong to the Hindustan Institute of Maritime Training (HIMT) and the temple is located at the entrance of their HIMT Pre Sea campus near Vengambakkam Junction, where one of the roads led to Kalpakkam Atomic Station. 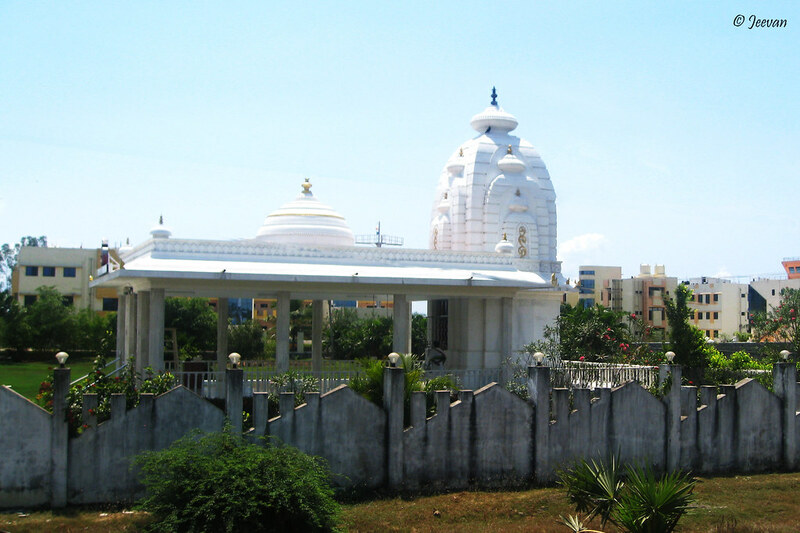 What interesting was the temple’s architecture, which enhances a style of Jain Temple? A couple of weeks back I had been to Pondicherry to attend a friend’s wedding and this is the first time I am attended a function out of my relatives (close) circle and been to a wedding after long back, I also got to relish on the wedding dishes. The bridegroom is a friend of mine from childhood and our fathers being best friends, whom worked and retired from the same govt. service, it’s obvious how we become friends. Though we aren’t in communication much in older days, the internet has changed the pattern later to become close, I decided to not to miss his special occasion. 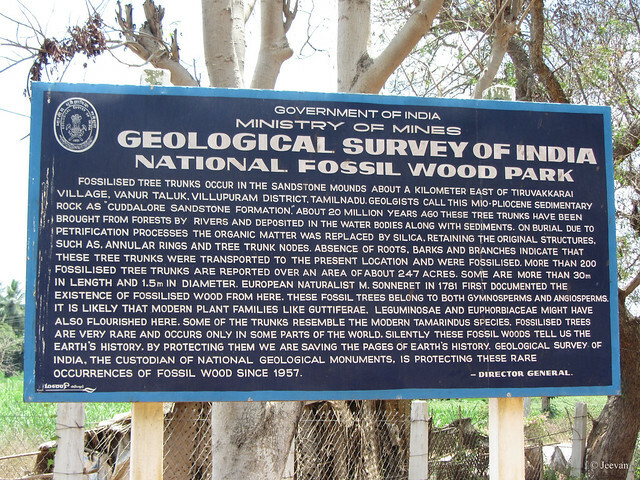 I already had a plan back then to visit the Petrified Wood Park (National FossilWood Park) at Tiruvakkarai on the sideline of attending the wedding, but I wasn't sure until everyone agreed to give company to the geological park located about 25 km west of Pondicherry, in the Villupuram District of Tamil Nadu. 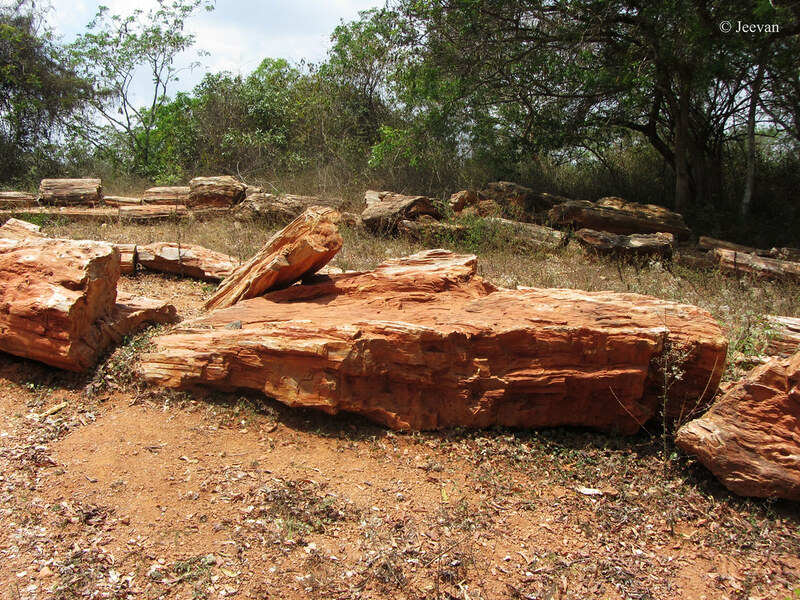 It can also either be reached from Villupuram or Tindivanam at about 28-30 kms respectably; the Fossil Wood Park settles on a sandstone mounds little bit outer from the Tiruvakkarai village on the bank of Sangarabarani River. From the time I read about this place long back in Hindu Metro Plus, I wanted to be there. Thanks to the GPS Navigation, there isn't any difficult for me finding route to the place and the road was also good enough except for few hundred meters close to the site being unpaved. When we visited, there were very few people in the park, but a van full of tourist unloaded as we suppose to leave the park. It’s really wonderful being there, even though it was a hot midday it doesn't bother much in front of woods displayed in rock formation which was truly amazing to think about. The Fossil Wood Park is maintained by the Geological Survey of India and over an area of about 247 acres; there are 200 fossilized trees ranging from 3-15 meters in length and up to 5 meters in width. But only a small portion of the sandstone mounds is open to the public, where they displayed the fossil woods as partially buried and strewn all over the area. A small ramp built along the mound takes us little bit around the park that contains petrified wood fossils, which is a special type of fossilized remains, where the organic matters are replaced with minerals (mostly silicate) while retaining the original structures, pattern and shades of the tree trunks. 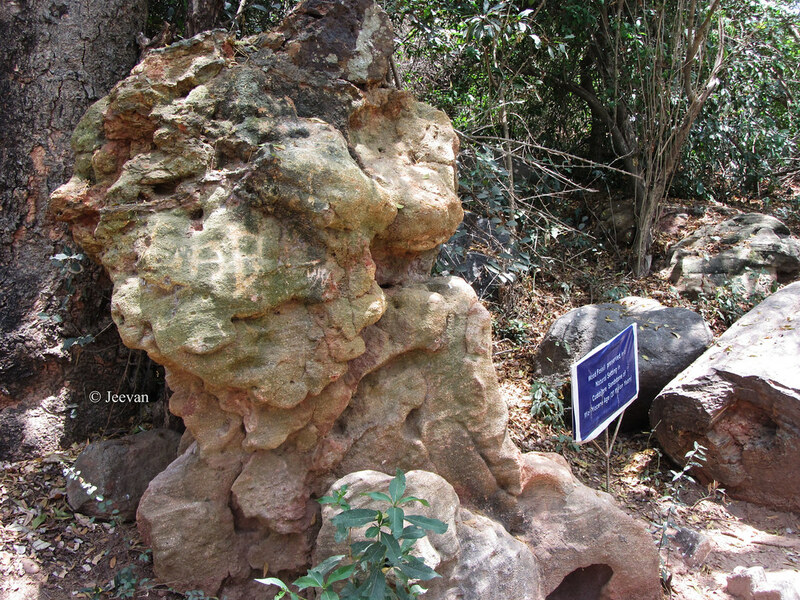 I think the information board (picture above) provide enough details about the park, but still for those who couldn't get to read: “Geologists call this (Mio-Pliocene Sedimentary Rocks) as “Cuddalore Sandstone Formations”. 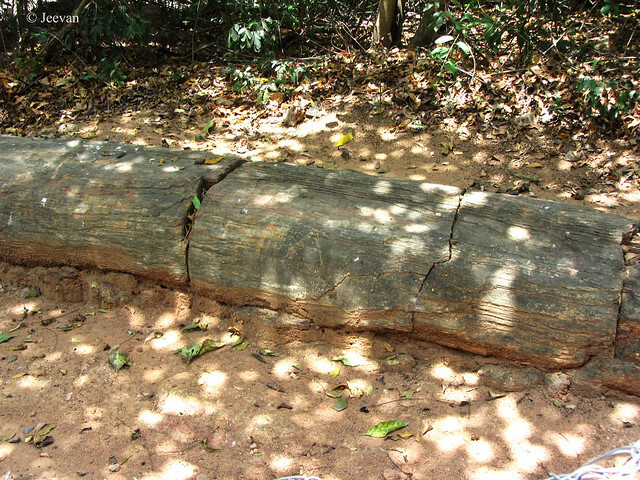 About 20 million years ago, these tree trunks are believed to carry by rivers and deposited in the water bodies along with sediments. In the absence of roots, barks and branches it make certain that these tree trunks are transported to the present location and fossilized. 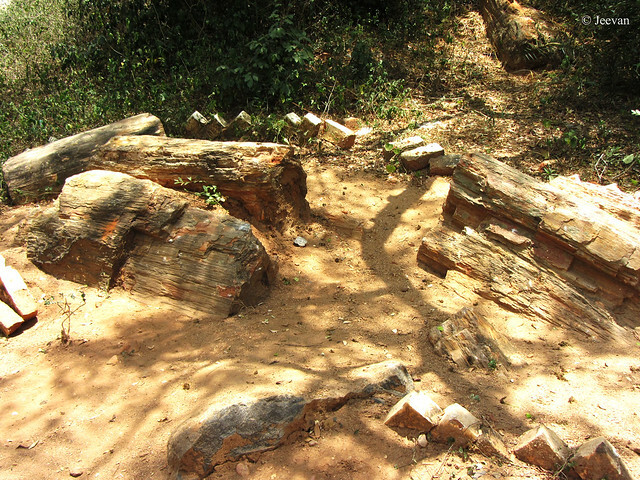 FYI: A piece of fossil truck displayed at Ooty Botanical Garden and Children’s Park in Chennai where also brought from here. Chennai had better/wonderful weather for last few days, thanks to the clouded sky, and surprisingly it downpour yesterday morning with just 3 inches left for the water to enter our home. I just woke up to a higher pitter-patter, which I thought was the guy (who used to wash our car regularly) is fetching water from the tap behind our bedroom window, but only realized when the sound extended. I was surprised to reveal that it was rain. It’s been more that two month since we shifted to this house and this is the first rain I experience here and also being a summer showering I couldn't enjoy it quite unlike before because of the cause it created. Being first on the row house and little lowly lay from the road, the rainwater easily run into our courtyard pools around the home and we couldn't ask even just a little more as water rose close to our home level. Although we expected water to stay little while it rain, but the entry of street water and heavy downpour all the sudden and also lag in draining transformed the courtyard into little Venice for a while. This really put off the excitement of rain, thinking what if monsoons arrive with constant downpour; there is an ample chance of water flooding the home like one of our neighbor warned from his past experience. There are rainwater drainage's in our area, but they aren’t in good condition and need to be restored. Wish the authorities look after these before the northeast monsoon arrive in October. 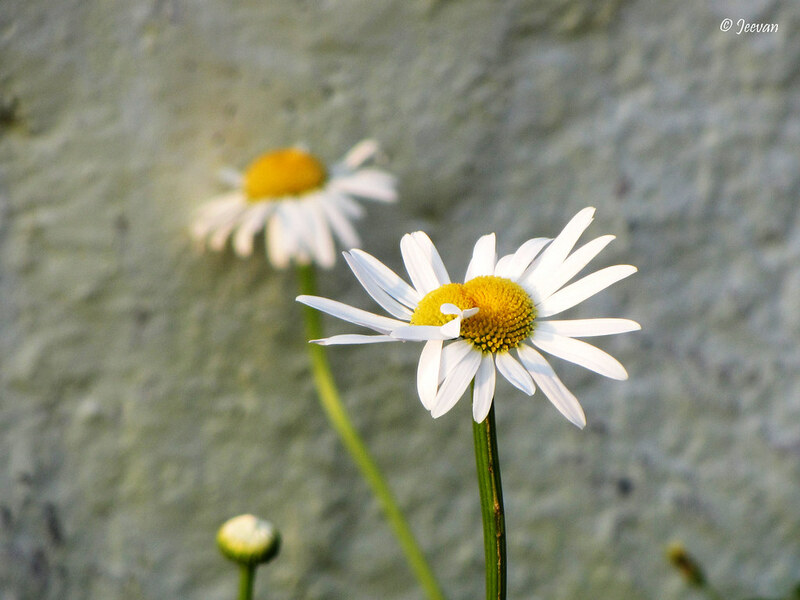 When I shot I focused it as a single flower but at home, later, checking the photos I find it (daises) to be conjoined and showed great intimacy towards each other. The photo was captured at Cloud Mountain and the guest house we stayed there had a long flowerbed with some colourful flowers bloomed to ornate the large courtyard. And daisy being one of my favourite flowers, which also grow in wild as well planted as ornamental flower, it was the first I went to capture among the flowers once I left out at the courtyard. Being evening and shimmering to glorious sunset, there was a great natural exposure on the daisy to captivate. But what I find more pretty here was the twist of the two white petals, which gives me a perspective of holding hands i.e. a thought of intimate. 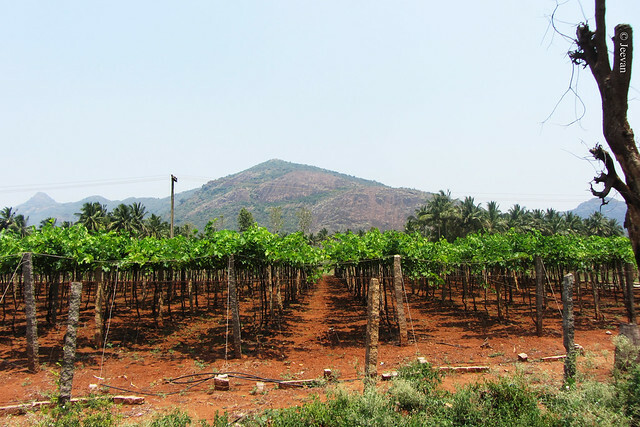 On my way to Cloud Mountain lately, as a part of my vacation, I come across many vineyards while driving towards the foothill from Chinnamanur. 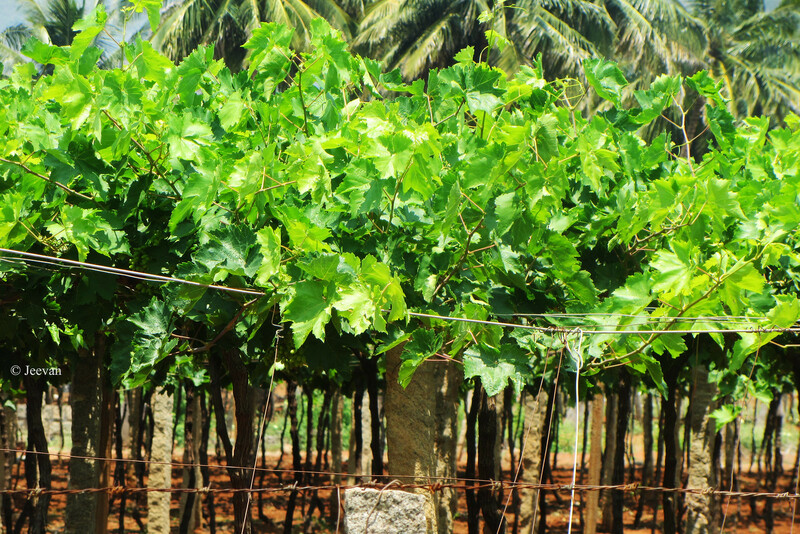 Coming into the Cumbum Valley in Theni district, which produces about 90,000 tonnes of muscat grapes and 10,000 tonnes of Thomson seedless grapes yearly, Chinnamanur is one of the major towns in the valley that embrace the cultivation of grapes and coconuts the most. Being the most fertile valley in south India, is almost red soil by nature that enriches the agriculture activities in this region. The Cumbum Valley enjoys an invigorating climate that’s ideal for grape cultivation and there are more than 4000 odd grape farmers in this region who are experts in grape farming. 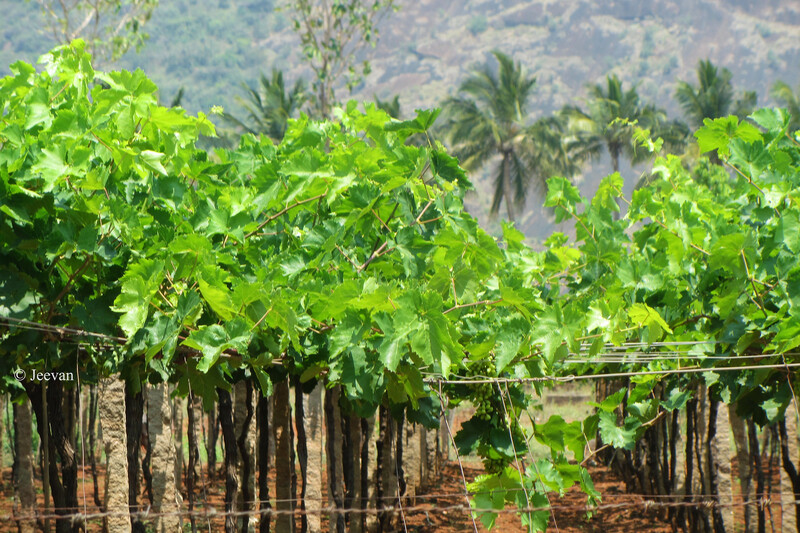 I share here some photos shot on a couple of vineyards that neatly fenced for the grapevines to thrive and while on the uphill task these vineyards looked like patches of green among the red soil and foliage of coconut groves. 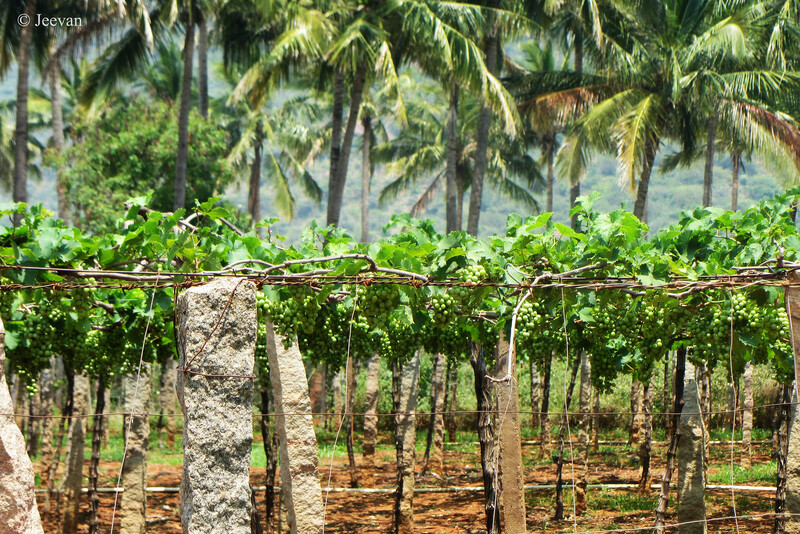 A brief on my early vacation come travel to Thandikudi and Cloud Mountain! Usually we go for vacation in midsummer to keep ourselves away from hot weather and chill sometime in pretty cool mountains/hill stations while visiting places in and around the destination. Although I have visited almost hill stations/mountains within the state of Tamil Nadu, I still believe there is a lot to be explored and experienced. Each time I plan to visit mountains or any other place, I look forward to go beyond tourism and take roads that less traveled and places explored at least. This time too, though, went to the places that I have been already, I tried to explore things that missed last time and observing more the nature and environment and experience things leisurely. After a gap of two years, I visited the mountains of Kodaikanal and stayed at Thandikudi followed by Cloud Mountain’s – which are a part of Western Ghats, from March 20-25. I was looking forward for a break/change from regular life since it’s been nearly a year I had vacation (in Ooty-Valparai) or traveled long, I decided to be earlier mainly to prevent the season’s crowd and easy accommodation at less fare/tariff. Being a month ahead to midsummer, it’s already terrific hot here and as we began the journey the sun was almost up in the sky shimmering bright, which is one of unusual with this travel as we always begin our journey early morning so that could easily get out of the city before it get congested and lesser heat. Our drive from home till the foothill of Thandikudi/Kodaikanal was under scorching sun, which we felt heavily on the national highways in lack of trees and the A/C in the car also went frozen to block the blowers. The heat was able to make feel even driving upon the mountains and being unseasoned to rain there wasn't a piece of cloud to hold umbrella. The coldness on the mountains was also not so high and bearable with plain blankets at night and only in the morning the chillness is felt. 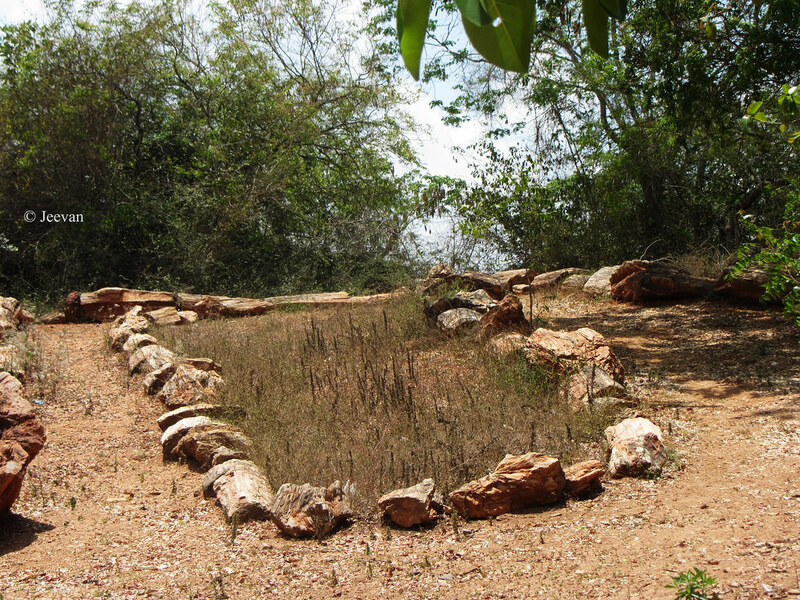 We had booked rooms in the Panchayat Union’s Narumana Kudil (fragrant hut/cottage), which we early stayed and it is one of the very few accommodates available at Thandikudi apart couple of high fee resorts. And it is a wonderful place to stay and watch birds alongside. But this time it wasn't fair enough to allow me to wander its premises, encompassed by coffee plantations and canopy of trees, because of lack of maintenance and unclean of fallen leaves gives a strange look across to move around. Moreover I didn't get the room I was looking for, which would ease my access through wheelchair so that I could come in and out of the room without much difficult. While booking in, itself we stressed for that particular room but those communicated hadn't conveyed it clearly to the management who had rented the room to some other. So I had to be transferred to a chair before getting in and out of the room to overcome a huge step and then back to wheelchair/car to move around. I expected to spent much time outside the room looking for birds i.e. it is a bird paradise in itself with many distinct bird species, even though I listen to their chirrups in various tones, I find only few birds with capable to shoot while others were tiny ones which treats me with sweet tweets. We stayed there for three nights and two days, which was spent mostly on drive and discovering new places/routes that I wanted to do for some time – will write more about it in detail later. I hope my future visits/stay at Thandikudi would be fine due to my uncle’s (mom’s sister husband) construction of guesthouse there, beside the coffee and orange plantations he bought two years back. 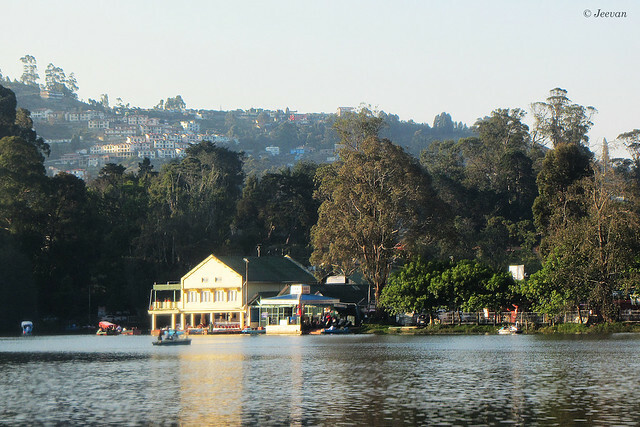 During my stay, I visited Kodaikanal only for a brief moment and took a leisure ride around the lake while capturing some photos and having a cup of coffee, we head back to room by late evening after purchasing some homemade chocolates. 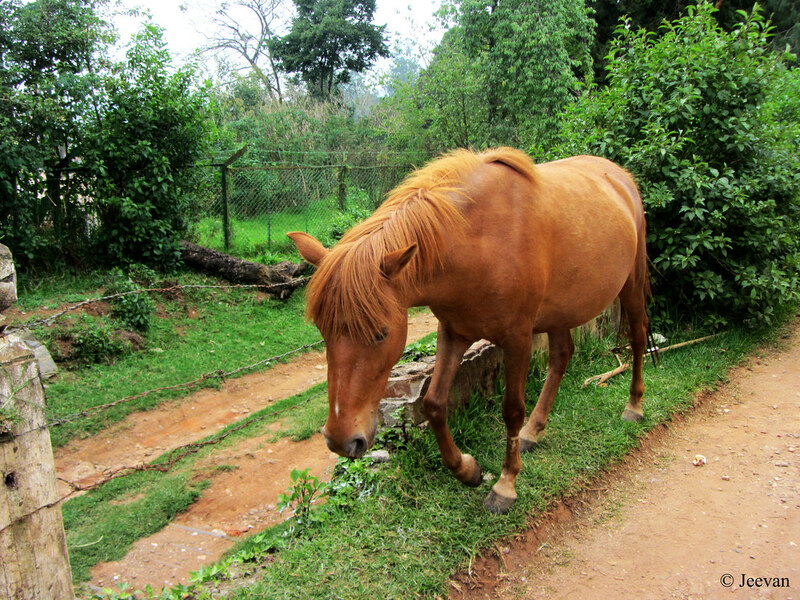 We haven’t planned to visit Kodaikanal that day as we are intended to stay there later; it was our car that forced us to check the princess of hills as it refused to start suddenly we are either to go to Vathalagundu (at the foothill) or Kodaikanal to rectify, we chose Kodai so that we don’t need to get down the hills. While the day went like that and the other spent on exploring some Ghats sections, the real excitement of the entire vacation was the chance to visit Cloud Mountain aka Megamalai! 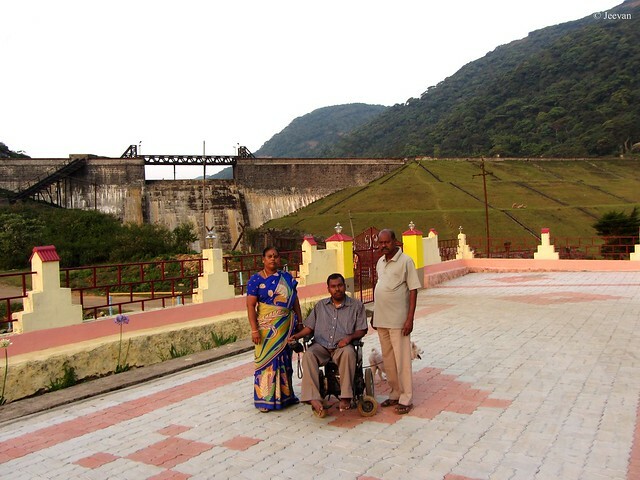 I have been to this part of Western Ghats Mountains in 2009, but I haven’t done a post or write a piece on the pristine mountains that guard the Cumbum Valley from the east. It is one of the few places where nature exists at its best/pristine stage and human intervention is at least. I avoided writing about this place and posting pictures then to do a bit on preserving and preventing exposure as I never want it to be seen as another spoiled hill station. I think it is a place not for tourist activities but to admire and experience nature. At about 1500 meter, the cloud mountain is dedicated to tea plantations and it comes under the High Wavy Township which is one among the three major tea estates who leased the land for 99 years. Getting there is not an easy task and one really needs a high ground clearance vehicle to venture the road that almost an off-road journey. One can drive up to High Wavy (there is also bus service) somehow, but trying to go beyond is painful. 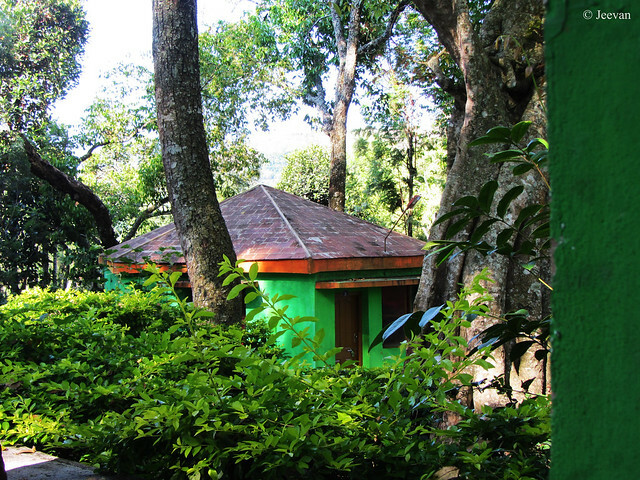 We haven’t planned to visit Cloud Mountain but it came as an offer from my cousin brother, whom we sought for booking rooms in Kodaikanal, and upon our willingness he booked rooms for us in the High Ways IB (inspection bungalow). I was telling to my dad, very lately, that we should go to Cloud Mountain once again, a place I visited as a day travel in 2009, I couldn't say no when someone offered such an opportunity. I was quite delighted to spend two days stood between dense forest, tea gardens and dams/lake in front and rear.